I dagene omkring CBC havde Amager Bryghus af fire omgange besøg af amerikanske gæstebryggere. Stovt har allerede bragt etiketterne til de to første samarbejdsbryg, her følger de sidste to. "We expected banjos and Bourbon but received nothing of that sort. Instead our brew day with the handsome fellers of Against The Grain Brewery from Louisville, Kentucky turned into a hotdog eating contest. Yep, no kiddin'. Big Kentuckian feller, Sam, challenged our own big feller, Jacob, as to who could down the most gourmet hotdogs, big and spicy as they were with specialty toppings. Well, Sam should never have done that….should you Sam? However, a beer was indeed brewed in between all the trash talk and wieners. We hope you'll enjoy this hoppy Imperial Brown Ale - it was designed to go with hotdogs in particular and other spicy and smoked foods." "The sunstone - much disputed among scholars. Did the Viking navigators really have such a tool that would help them point out what was east and what was west - even on a less than sunny day? We certainly believe so. 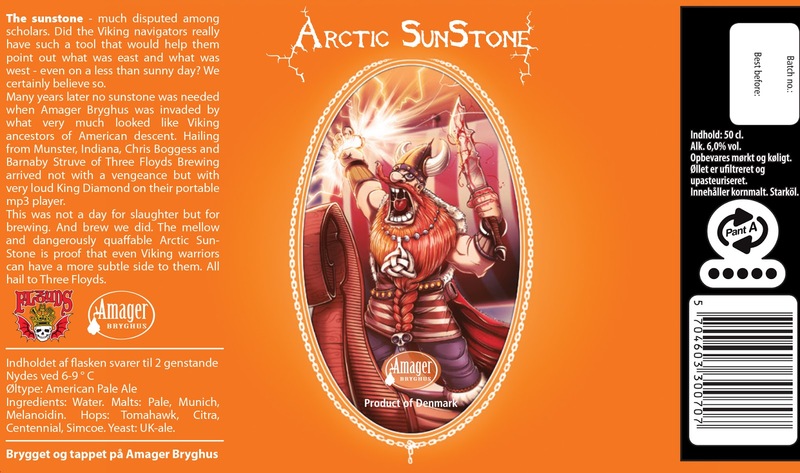 Many years later no sunstone was needed when Amager Bryghus was invaded by what very much looked like Viking ancestors of American descent. Hailing from Munster, Indiana, Chris Boggess and Barnaby Struve of Three Floyds Brewing arrived not with a vengeance but with very loud King Diamond on their portable mp3 player. This was not a day for slaughter but for brewing. And brew we did. 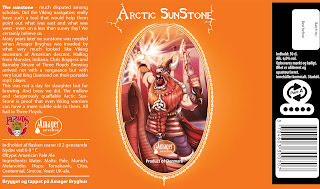 The mellow and dangerously qua able Arctic Sun- Stone is proof that even Viking warriors can have a more subtle side to them. All hail to Three Floyds."